WINNIPEG, Manitoba (AP) The Vegas Golden Knights are going to the Stanley Cup Final – with a chip on their shoulder. 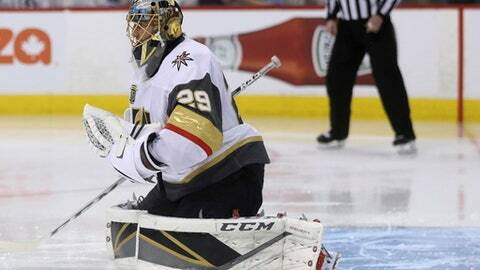 Reaves scored the winning goal, Marc-Andre Fleury made 31 saves and the Golden Knights beat the Winnipeg Jets 2-1 on Sunday to wrap up the Western Conference final in five games. Alex Tuch also scored for the Knights. They lost Game 1 in Winnipeg before winning four straight to become the first expansion team since the 1968 St. Louis Blues – when the six initial expansion teams were put alone in the West – to get to the final. Vegas will meet Tampa Bay or Washington in the final. Tampa Bay leads the Eastern final 3-2, with Game 6 set for Monday night in Washington. The Knights, whose jaw-dropping inaugural 109-point campaign included a Pacific Division crown, swept Los Angeles in the first round, and knocked out San Jose in six games in the second. Josh Morrissey scored for the Jets, and Connor Hellebuyck made 30 saves. ”It’s very difficult to find that positive feeling at this moment,” Jets coach Paul Maurice said. Reaves, the bruising Winnipeg native acquired from Pittsburgh before to the trade deadline in February, snapped a 1-1 tie with 6:39 left in the second period when he tipped Luca Sbisa’s point shot past Hellebuyck. Reeves last goal before Sunday came 3 1/2 months ago while with Pittsburgh. Fleury stopped 151 of 161 shots in the series, and allowed just six goals the rest of the way after giving up four in the opener. ”Everybody’s stepping up at different times,” Fleury said. Winnipeg got a power play early in the third, but couldn’t muster much of anything. The Knights smothered much of the Jets’ attack for the next 10 minutes, with Hellebuyck having to come up with big stops on William Karlsson and Eric Haula to keep his team within one. The Jets pressed with under 4 minutes to go, with Fleury stopping captain Blake Wheeler on the doorstep, but it wasn’t nearly enough as the Knights closed out their third straight series on the road. The Jets had the NHL’s second-best record with 114 points in the regular season. They advanced to the first conference final in city’s history with a five-game victory over the Minnesota Wild in the opening round before topping the Presidents’ Trophy-winning Nashville Predators in Game 7 on the road. The usual raucous, white-clad crowd at Bell MTS Place were silenced just 5:11 into Game 5 when Tuch jumped on Morrissey’s turnover and fired his sixth past Hellebuyck. The Jets were tentative to start and it got worse after the opener as Vegas dominated the next couple of shifts, forcing some good saves from Hellebuyck before Winnipeg got its feet moving. After being outshot 7-1 in the first 7 minutes, the Jets finally pushed back and turned the tide with the next nine attempts on goal, culminating with Morrissey making amends for his early gaffe with 2:46 left in the period. Bryan Little won a faceoff in the offensive zone straight back to second-year defenseman, who blasted his first career playoff goal past Fleury’s glove. One of Winnipeg’s downfalls in the series through four games was an inability to maintain momentum. The Knights scored within 1:28 of a Jets’ goal in each of the first four games – a crushing 12 seconds after Winnipeg tied Game 3, and an equally gut-wrenching 43 seconds after the Jets knotted Game 4 – but they managed to take the game to the locker rooms tied 1-1. Both teams had chances in the second period before Reaves made it 2-1, with Jets center Mathieu Perrault just missing on a pass from Little that had too much speed. Right after Reaves scored the second playoff goal of his career – and first since 2015 with St. Louis – Winnipeg’s Nikolaj Ehlers rang a shot off the post on Fleury. NOTES: The Jets were an NHL-best 32-7-2 at home in the regular season, but were a pedestrian 5-4 in the playoffs, including losses in four of their last five post-season outings. …. Winnipeg had won a combined 13 straight at home before dropping a 2-1 decision in Game 4 against Nashville.